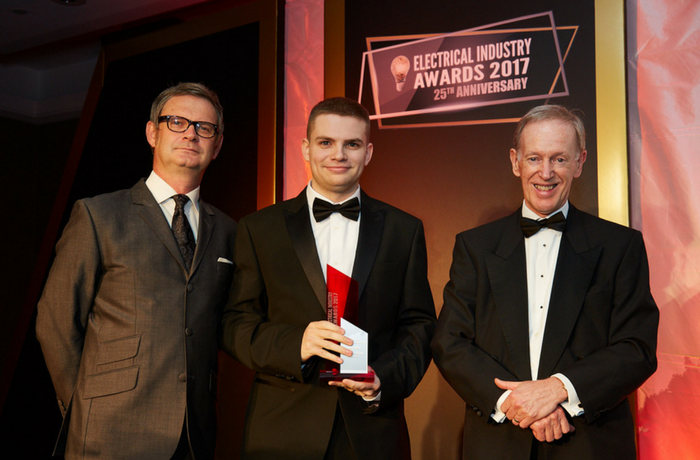 A JTL apprentice who works for Chris Bowker Ltd in Morecambe has won the Apprentice of the Year Award at the Electrical Industry Awards 2017. Joel Collins was delighted to be shortlisted and to hear his name called out at the awards evening as winner of this prestigious award. Joel started his Apprenticeship with Chris Bowker Ltd on the 17th September 2013 at the age of 16 and was signed on to the level 3 NVQ Electrotechnical Diploma with leading training company JTL. As part of his Apprenticeship Joel attended Lancaster & Morecambe college where he completed the underpinning knowledge elements of the Diploma over a 2-year period. Joel also completed his ICT Level 2 Functional Skills during this period. He developed his practical skills across a wide range of jobs encompassing leisure, commercial and health care projects, specifically schools and large-scale hospital refurbishments and new builds across the North West. Joel has been a valued member of the team and has progressed from general installation activity through to more complex activity such as fault finding, testing and final commissioning. Joel decided to progress his knowledge of the sector and started an HNC in Electronic & Electrical Engineering in September 2016. He has completed his first year at Blackburn College and returned to college last month. Joel applied his practical skills outside of the workplace in support of Aid International by travelling to Zambia in the summer of 2015 to assist in the building of a school. His outside interest away from work is drumming. He has played in several bands across the North West, and wider afield including playing at the Royal Albert Hall London and touring across South Africa. Joel recently completed his Apprenticeship ahead of his projected end date at the age of 20 after passing his AM2 on his first attempt. His NVQ Assessor stated that “Joel’s drive and determination was recognised early on by his employer Chris Bowker Ltd and JTL. Joel is identified as a future contract manager in this highly successful and growing company where his strong work ethic and diligence on site ensures the job is completed on time, to contract and to the highest standard”. JTL is a not-for-profit company delivering apprenticeships in the building services engineering sector. It operates across England and Wales but despite being a national provider, offers local support through a team of over 130 specialist Training Officers, ensuring there is a locally based individual to support all its apprentices and all the employers with which the company works. Around 35,000 young people have completed JTL apprenticeships over the past 26 years or so, and almost one in two of all electricians in England and Wales achieve their qualifications through JTL. JTL currently has more than 6,000 apprentices at various stages of their apprenticeships and works with more than 3,000 employers across the country.